The Abakaliki ring road was originally conceptualised and constructed in 1982 to decongest intra-city commuting and enable ease of evacuation of agricultural and natural resources. The ring road was further elongated and made orbital by the administration of Dr. Sam Egwu, in 2001. The road spans 198km, and cuts across and encircles 8 Local Government Areas (Abakaliki, Izzi, Ebonyi, Ohaukwu, Ezza North, Ezza South, Ishielu & Ikwo LGAs) of Ebonyi State, thus covering approximately 62% of the total LGAs in the state. 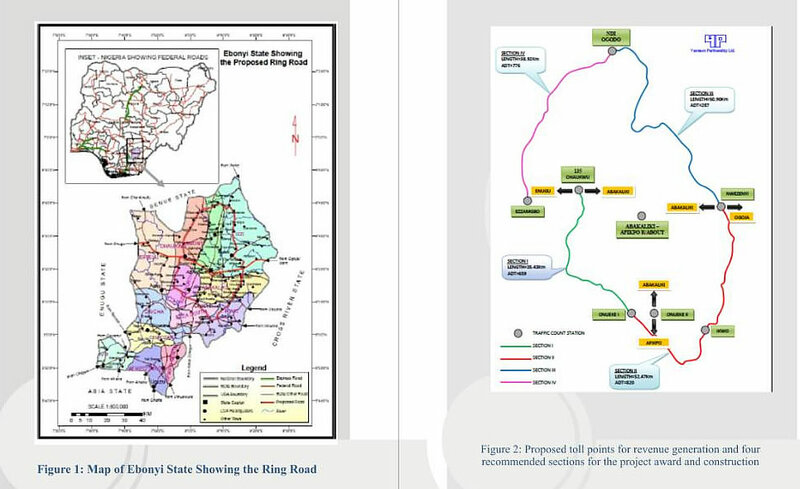 The ring road effectively serves the population of about 2,700,000, corresponding to 62% of the total population of the state as estimated by Ebonyi State Planning Commission for 2016 fiscal year. Several businesses, schools, hospitals and other commercial ventures sprang up and flourished along the entire lengths and breadths of the ring road after its completion in 1982. Dilapidation of the ring road has created untold hardship to the people who solely depend on the road for commuting as well as socio-economic activities, while many businesses have been stifled. This has consequent adverse effect on the micro- and macro-economy of the state and has robbed it of the much desired Internally Generated Revenue (IGR). The most important development plan of Ebonyi state which is at the lips and desire of every Ebonyian is the construction of the ring road. The population covering over 95% are fully in support of getting this loan as soon as possible for the immediate reconstruction of this ring road. In fact it was the immediate past administration that initiated the request for this loan. Even though the present Governor who was then a State Party Chairman and later Deputy Governor, initiated the need to borrow to construct the road but, it was highly supported and approved by the then Executive Council, House of Assembly and the entire Ebonyi people. Effect of the Ring Road on the Transport Sector. The ring road if reconstructed will; Promote economic development, extend trade, and improve state’s competitiveness through an efficient and affordable integrated transport system. Promote the use of public transport over private cars. To create flyover intersection to reduce accidents and save travel time. Promote a culture of maintenance and continuous upgrading of transport infrastructures and services. Promote competition and efficiency and cost reduction of transport services in Ebonyi state. Improve the safety, security, reliability, quality and speed of movement of goods and people, at state and local government and community levels. Support LGAs and the state capital territory in the development and promotion of urban transport systems and local government developing and promoting rural accessibility. Plan for the integration of 13 LGAs headquarters with light gauge railway programme and to later integrate this to the national railway programme. The ring road is of immense business importance to Ebonyi State in particular, Nigeria and the West African sub-region at large through the African Trans Sahara route which is overall about 60% completed 100% completed within the ring road of Ebonyi state. The ring road leads directly into northern Cameroon which is a regional commercial hub. The business and commercial implications of the ring road will be highlighted under the agricultural, solid mineral, social, commerce and industrial sectors. Effect on the Agricultural Sector. Rice Production:Current production capacity of Ebonyi State under private sector participation is about 150,000 MT/annum. State government has injected over ₦30BN in the last 2 years in partnership with local farmers towards rice farming. State has ₦4BN initial matching grant with BOI to support small and medium agriculture and solid mineral enterprise which is made available to all Ebonyians with useful business proposals. State endeavour to expand production is currently hampered by bad state of the ring road hence, the dire need for it to be reconstructed and this has virtually direct connections to most movement of goods, personnel and services across the entire state. An estimated 4738.33Ha is available for mining within and around the ring road corridor. -Total annual revenue from royalty =₦6.8BN/annum. The share of the state together with proceeds from other parts of the state revenue earned shall be deployed over the years towards repayment of the loan.